I am a stay at home mom, who has never paid much attention to UFOs. Last Friday, my kids were still asleep in bed, when I awoke at 6 am. I was in the bathroom and it was completely dark outside. All of a sudden I noticed a bright light shining in through a large window. The light was travelling slowly across the bathroom floor, which has 3 large windows in it. I noticed it immediately, as we live deep in the forest, far away from neighbors. Our house is located on 8 acres of forested land, and the bathroom is on the second floor. 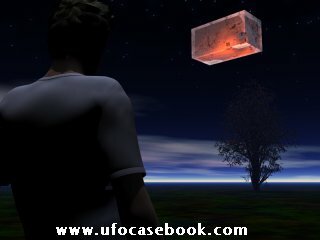 I walked over to the window and looked up, and to my utter shock and amazement, I saw a gigantic rectangular shape moving slowly just above the tree line. The window was open, and I heard a low humming noise coming from it. I was awestruck as I tried to make sense of what I was witnessing. The craft was as large as a 747 airplane in length, as it slowly passed by. I couldn't see any of the sides or the top as it was so low down and close to our home, less then 50 feet from the house. I could only see the bottom, which was filled with rows of red and white lights. There were 3 rows of glowing illuminated white round lights the whole length of the craft on each side, for a total of 6 rows. In between the white rows of lights were 2 rows of red glowing lights. The lights were dim, similar to car headlights pulling up in front of the house at night, but were clearly round shaped. I was frozen in the spot, and didn't even think to run and try to capture the image on my phone, which wasn't on me. At each of the four corners were red blinking lights. The shape was definitely flat and rectangular, like nothing I have ever seen in my life. The craft glided by for about 60 long seconds, and slowly drifted out of my line of sight, over the trees. As it got further away, the lights turned to look bluish, and I could no longer see the detail of the round lights. I called my husband right away, as he had already left for work, and then I called to report it to the local police, who had not received any other calls and didn't know how to respond. I was very scared to witness this, and am still having a hard time coming to terms with it. I know it was much too large to be a drone of any type, and all other indications about its shape, sound, height, and movement prevent me from believing it was anything identifiable as manmade.